I love mangoes! 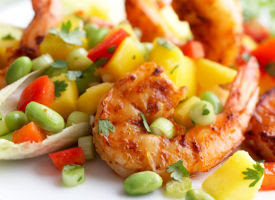 If you haven't tried mangoes in a savory recipe, you must. It is delicious. This recipe from Eat Better America is a great one. 1. Combine mangoes, edamame, bell pepper, onion, & cilantro in a bowl. 2. In a separate bowl, whisk together lime juice, 1/2 T. oil & salt. Pour over veggie mixture & toss to coat. 3. Heat 1 T. oil in a large skillet over medium high heat. When the oil starts to shimmer, add the shrimp & cook for 2 minutes per side.